MyBowl is an education tool that is an extension of the MyPlate food guide, used across the United States. MyBowl is designed to show how easy it is to meet dietary recommendations with meals served in bowls, like breakfast cereals. MyPlate is a recognized education instrument developed by the USDA that brings to life the 2010 Dietary Guidelines for Americans, to help people get the most nutrition from their meals. 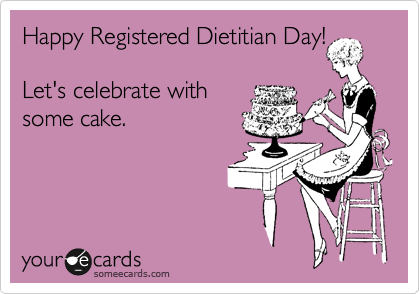 A recent survey shows that 100% of RDs are aware of MyPlate and 99% of them agreed that it is a helpful tool. There’s an opportunity to help consumers further understand and apply MyPlate recommendations to meals people eat in bowls, too. Using specific visual cues, images, and icons are effective ways to educate the public. MyBowl helps illustrate and extend the message that all food groups can fit into all meals, even those traditionally served in bowls like cereal breakfast, soup, and salads. 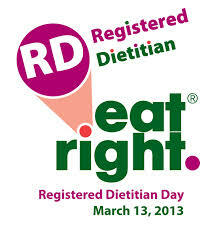 95% of RDs expect the MyBowl graphic to be used in addition to MyPlate. Like MyPlate, MyBowl is a simple visual cue to help people get the most nutrition from meals served in bowls. MyBowl is a simple tool that helps people understand how specific foods fit into “food groups”, like how a cereal breakfast with fruit delivers servings from “grains, dairy and fruit food groups”. 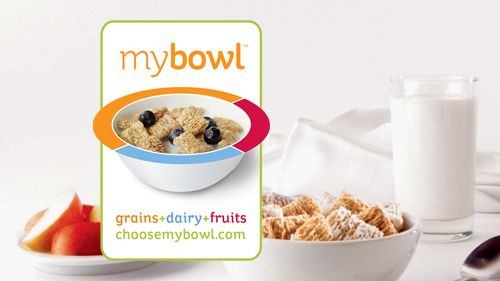 MyBowl was purposefully created to match the features of MyPlate. The MyBowl colors are identical to those used in MyPlate. The positioning and size of the colored bands around MyBowl reflects different types and amounts of foods and food group combinations that could be enjoyed in a bowl. When used as an online interactive tool, the size and color of the bands around MyBowl will change to reflect the amount and type of foods actually in the bowl. ChooseMyBowl.com is an interactive site that features tips, tools and meal plans to show people how to make smart choices and enjoy a variety of food groups and nutrients in delicious bowl meals. While more than half of all adults would like to eat breakfast every day, only one-third actually do. Nearly all moms want their kids to eat breakfast every day; however, 40% of moms report their child doesn’t eat breakfast daily. While nearly all toddlers and preschool-age children are eating breakfast, consumption of breakfast decreases as American children grow older. 77% of young children eat breakfast every day, but the number falls to 50% in the middle-school years and 36% among high school students. The latest research from the International Food Information Council (IFIC) shows people who eat breakfast regularly have higher intakes of several vitamin and minerals. 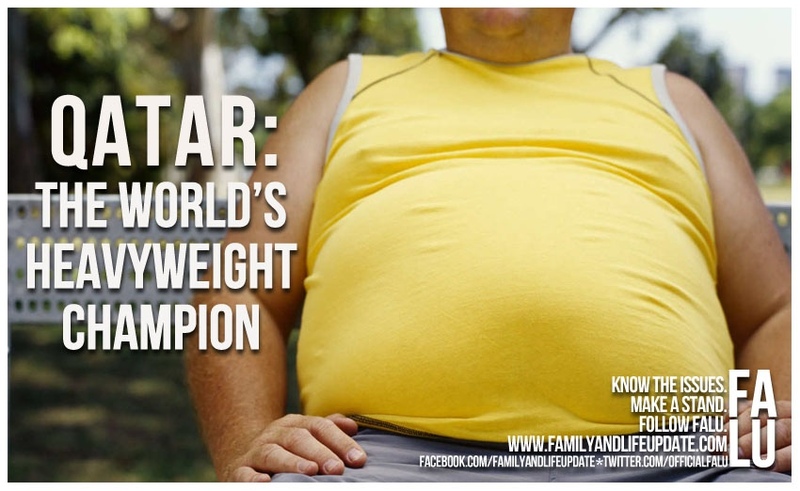 The same research noted that breakfast skippers may not make up for missed nutrients at other meals during the day. MyBowl helps people realize that eating breakfast can be a fast and easy solution to achieving a varied diet and meeting nutrient needs. When it comes to breakfast, cereal with non-fat milk is a nutrient-dense choice eaten in a bowl, delivering several essential nutrients in less than 150 kcal per serving, on average. Cereal with milk is the leading source of 10 nutrients in children’s diets and provides four nutrients, including fiber, most likely to be lacking in kids’ diets. Cereal with milk may deliver good or excellent sources of the 4 nutrients of concern- calcium, potassium, vitamin D, and fiber. Studies show that cereal eaters have higher intakes of many essential nutrients including B vitamins, calcium, vitamin A, and vitamin D. Numerous studies show that a cereal breakfast is associated with a lower BMI in both children and adults. Cereal with milk is an affordable breakfast option- costing just 50 cents per serving, on average. A cereal breakfast can help Americans get more fiber, which was noted in the 2010 Dietary Guidelines for Americans as a “nutrient of concern”. Nine out of ten Americans don’t meet daily recommendations for fiber. On average, Americans consume just about half of the required fiber that they need each day. Many experts think Americans poor fiber intake is a public health concern for both adults and children, with potential consequences that may increase the risk for several chronic diseases and obesity. In a recent survey, 90% of RDs agreed that a cereal breakfast is one of the best ways to easily increase fiber intake. On average, Americans only get 18% of their daily fiber at breakfast. 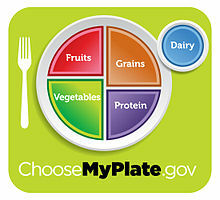 The MyPlate design published by the USDA. 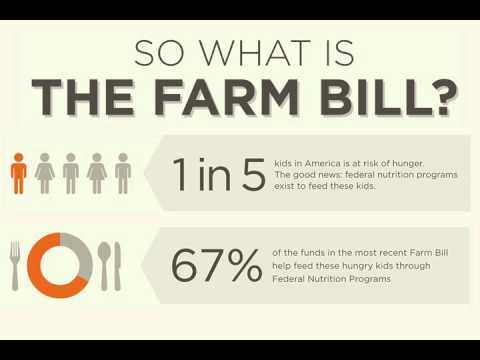 This replaced the MyPyramid in June 2011, ending 19 years of USDA food guide diagrams.